Our airborne networking stack performs routing and topology control for airborne networks. The technology maximizes network bandwidth with the available antenna resources while using the network context information such as node mobility, link health, network congestion and available node energy to create a reliable network. Predicting mobility based link loss and incorporating it in route planning. Queue-length aware routing to reduce congestion. 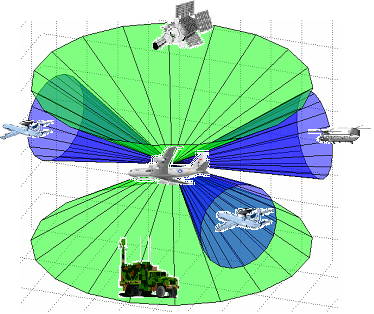 Topology control creates and maintains a high-throughput airborne network. MAToC controls the antenna direction, channel frequency and the transmission power to create a stable network. Adapts to link-loss because of channel jamming or interference.